The leading undergraduate psychology of religion text, this engaging book synthesizes cutting-edge theories and findings into an accessible account enlivened by personal reflections and contemporary examples. 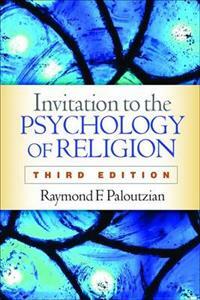 Raymond F. Paloutzian offers an authoritative overview of theoretical and empirical foundations; experiential, developmental, personality, and sociocultural dimensions of religion and spirituality; and clinical implications. Students are also given food for thought about bigger questions--how religion influences their own lives; what beliefs or values they hold most dear; and how to live in a multicultural, multireligious world. Each chapter opens with a brief topic outline and concludes with "Take-Home Messages" and suggestions for further reading. New to This Edition: *Reflects many years of scientific and theoretical advances. *Chapters on psychological theories, personality, and physical health. *New organizing concepts: religious meaning systems and the multilevel interdisciplinary paradigm. *Additional pedagogical features, including end-of-chapter "Take-Home Messages" and engaging topic boxes. *Descriptions of cutting-edge research methods. *Increased attention to multicultural issues.